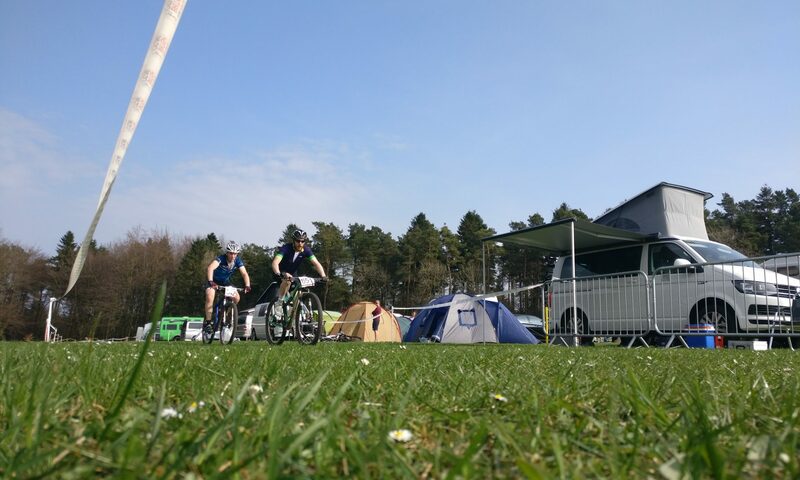 My original plan after Sherwood was to go and race Battle on the Beach on the tandem with Nathan in Wales – a fantastic race I’d massively recommend. However, after a check up at the hospital (where I really thought I might have actually broken something) it turned out to be muscle tearing in one of the rotator cuff muscles under my deltoid. This meant very gentle exercise and no mountain biking. As BotB was only 2 weeks after Sherwood, that race definitely wasn’t happening and ergo my earlier comment about maybe not making Dalby. I’ll admit to feeling pretty down about missing one of my highlight races after my crash, especially as it wasn’t my fault. I tend to have issues with my mood if I don’t exercise, so I wasn’t the nicest person to be around. When my shoulder started to not ache quite so much I started doing some running just to get out of the house and do some exercise. As this went OK, the weekend before the National I went for a gentle spin with Meg in the bike trailer and felt OK. I was positively buoyed up by this! Oh, and by the way, if you suffer any soft tissue damage to the shoulder – this was really helpful. On top of these shoulder exercises I also spent time doing the 30 day Yoga Challenge on the Sufferfest app which seemed to help get some flexibility back into the shoulder. After a 45 minute turbo session on the Monday and a 2.5 hour night ride on the road bike on Tuesday, everything seemed to be OK so I made the call and let Nathan know we were going to race. I did another turbo session on Thursday to prepare as best I could after 3 weeks of no riding and packed the van. With little effective training in place I was doubtful I would amaze myself with my performance, but I was happy just to be racing. 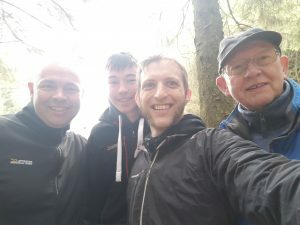 We got up to Dalby to walk the course on Saturday – which really was no different from all the other times we’ve raced there. Not that I mind; its an excellent course! The only real change was that Medusa’s Drop was open. This looked quite scary but doable whilst walking it, so I set myself the challenge of riding it during the pre-ride. Which I did, twice (after crashing once – it turns out the hardest part was getting the starting turn correct). To prepare for the day, we had scrambled eggs and smoked salmon for breakfast – high in protein and some good quality fats. I wasn’t too bothered about carbs at this point as that would come in later during lunch. This consisted of roast chicken with salad, beetroot and radish, with bananas and flapjack. Whilst oats aren’t strictly Paleo, I tend to relax my diet immediately prior to and after racing and training hard. I still avoid gluten and dairy though! Nathan’s race was first under really dry and dusty conditions and he did well to finish in 32nd place with times that were better than two years ago. I got another lap before we went back to Nathan’s mum’s house for sleep and dinner and I felt as ready as I was going to be for Sunday. Dinner was made up of chicken soup, beef and lamb, potatoes, plenty of red cabbage, carrots and sweet potatoes. 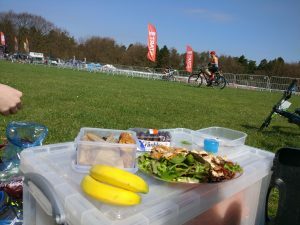 Plenty of protein to aid in muscle repair and lots of veggies and slower release carbs ready for tomorrows race. Breakfast on Sunday was Shakshuka – an spicy Israeli dish with tomatoes and eggs. It’s different, but delicious! We opened the curtains to see it was obvious we’d had some rain overnight which was going to make Medusa’s particularly tricky – roots and rain don’t mix well on a tough descent, but with an approximate 12 second advantage it would be a tough call to make. 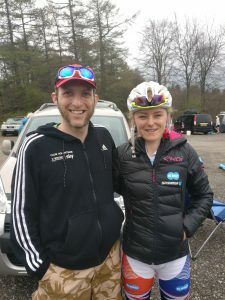 We headed to the race venue early to cheer on Libby in the U14 girls race (who had a really tough time with a sickness bug – cracking result by the way Lib!) and to go and check it out. Thankfully being under the trees and well draining it looked fine to race on. Following this, I warmed up thoroughly, sorted my bottles (numbered depending on laps, and I tape gels to the top). It’s really quite hard to find good quality Paleo nutrition, so I tend to use Skratch Labs drink in the bottles (natural ingredients and easy on the stomach) and then use Hüma gels for fuel. It works really well for me and the caffeine Lemonade ones are particularly fantastic! This was also the first time I tried racing without actually carrying anything on me. I had a can of sealant on the seatpost, a tube in a 79 Projects Piggy behind the bottle with my CO2 inflator and my OneUp EDC multitool in the steerer tube. 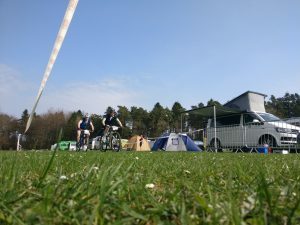 Once I was gridded, I knew I’d either have to go really hard off the start or just ease back – the entrance to the first section of singletrack and the subsequent queues meant you had to be in first or you might as well wait. I tried hard from the fourth row to make up places, but it wasn’t to be. I made a few places on the starting loop and was feeling pretty good until my rear mech started skipping and making a weird noise. I checked it out and couldn’t see anything until I started up the first big climb and my chain broke! Gutted. I spotted Chris Bailey who’d trashed a mech unfortunately and had a bit of company while I used my OneUp EDC to replace a link and get going again. As far as I was concerned now my race was as good as over – I’d lost around 6 minutes in total here so I just made the decision to really race the downs, have as much fun as possible and still try to hit my goals on the climbs (no walking up the technical one and up in less than 4 minutes on then long one). I did that! I’ve found this year that setting yourself goals in races that don’t depend on anyone else can still be a great motivator and get you some real personal successes in races despite calamities! 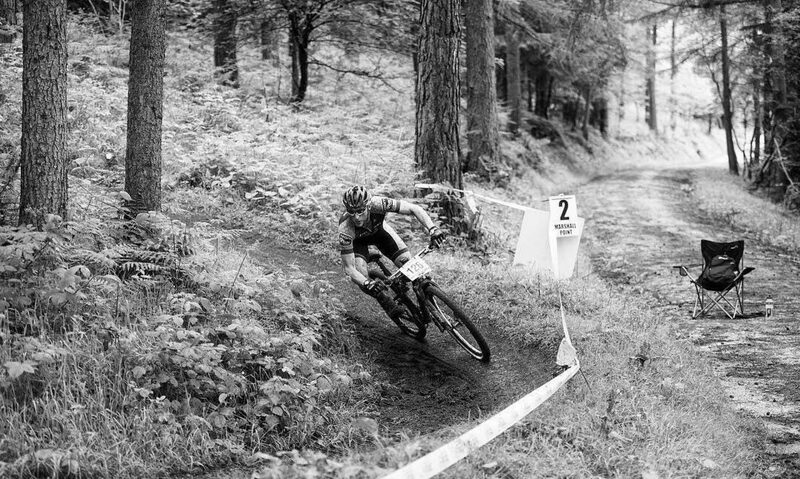 I rode the rest of the race, enjoying myself thoroughly until I burped a tyre railing a berm a bit too hard and needed a bit more air in the pits. When you’re not at the pointy end, what does it matter? Unfortunately I didn’t get to complete all four laps due to getting lapped, but I had a great time. Now it’s just a matter of cleaning and repairing bikes and kit and get training again!